Rajinikanth Film Review From Adhisaya Piravi. Adhisaya Piravi Movie. Rajini Film Adhisaya Piravi. Rajinikanth Adhisaya Piravi Movie. www.rajinikanth.com. Rajni, is supposed to marry Sheeba, an alliance not approved of by her father. He is killed and goes to Heaven only to learn that his death was a mistake. He is offered another body to inhabit, that of a timid villager whose uncle and aunt are plotting to kill him. He takes up the offer and teaches them a lesson while romancing with Kanaga. But coming into contact with some characters from his earlier life, reminds him of his duties over there too. He solves all problems and all's well that end well. A movie with lots of promise but not realised to the full extent. 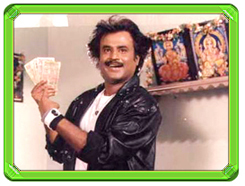 Rajni's time in heaven is great fun as he fights with Chitrgupta and dances around with Rambha. The part where he corrects the uncle and aunt are good fun too. But a slow first half-hour and a ridiculous climax pull down the movie. Has a nice sequence where, Rajni and Yama and Narada go through earlier roles of Rajni while looking for a body for him to move into.